I have, or had (I think I managed to get rid of one), a complete set of these PHQ stamp cards featuring British conductors. I find portraits tend to be boring at the best of times unless the artist is especially gifted or the face has plenty of character. But these could have been so much better if the conductors had been shown "in action". I would have shown you the rest of the set but I was just too bored. 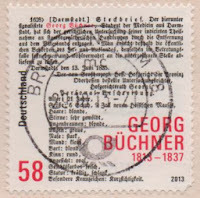 The second I show is a stamp which arrived from Germany just the other day. It looked as though it might have been interesting but I needed a magnifying glass to realise that the script was Gothic and virtually unreadable. So it probably isn't boring but I don't really know. Secretly I rather like it though. I also find portraits to be a little on the boring side. Many are also not of people who are perhaps internationally famous, which limits interest. 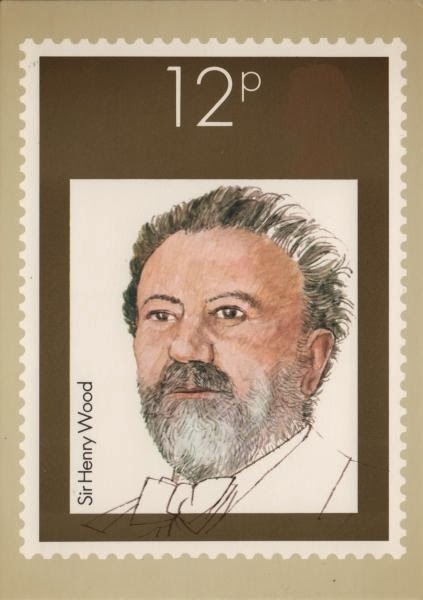 An addition on the stamp of something related to their work would help. and I get frustrated when I can't read what is written on the stamp. grrr. I agree with you on the second one. Not much of interest visually and then unreadable script! Thank you for joining me on this boring interlude. Yes, the composer set is a bit dull, which is a shame. 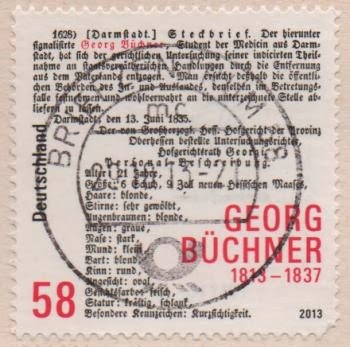 I quite like the German stamp, and it would prompt me to reach for a magnifying glass or scan it and google. I agree. It should have been better if they're shown in action and not just featured with their faces on stamp. 1928) [Darmstadt] Steckbrief. Der hierunter signalisierte Georg Büchner, Student der Medicin aus Darmstadt, hat sich der gerichtlichen Untersuchung deiner indicirten Theilnahme an staatsverräterischen Handlungen durch die Entfernung aus dem Vaterland entzogen. Man ersucht deshalb die öffentlichen Behörden des In- und Auslandes, denselben im Betretungsfalle festnehmen und wohlverwahrt an die unterzeichnete Stelle abliefern zu lassen. Darmstadt, den 13. Juni 1835. This is a profile because he was wanted by the judge. I think it is not boring. You are so funny. I, too, find most portraits boring but I have loved taking "faces" of people here in India.